The Joint Interoperability Test Certification is provided by the Joint Interoperability Test Center (JITC) (J-6 = the Organization Designation) upon completion of testing that indicates a system has successfully passed interoperability and Supportability (I&S) testing and has met its Net Ready-Key Performance Parameter (NR-KPP). The certification is issued during the Low-Rate Initial Production (LRIP) of the Production and Deployment phase prior to the Full Rate Production Decision Review (FRPDR). 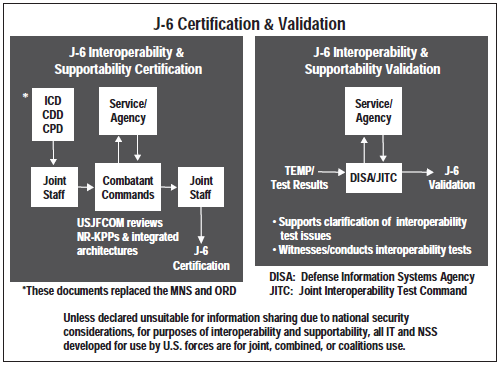 Interoperability and Supportability Certification supports the validation and approval of the Capability Development Document (CDD) for Milestone B and the Capability Production Document (CPD) for Milestone C. The Joint Requirements Oversight Council (JROC) actually validates the CDD/CPD prior Milestones B and C.
Once the JITC test certification has been issued, JITC J-6 issues the Interoperability System Validation indicating that the entire process is complete.